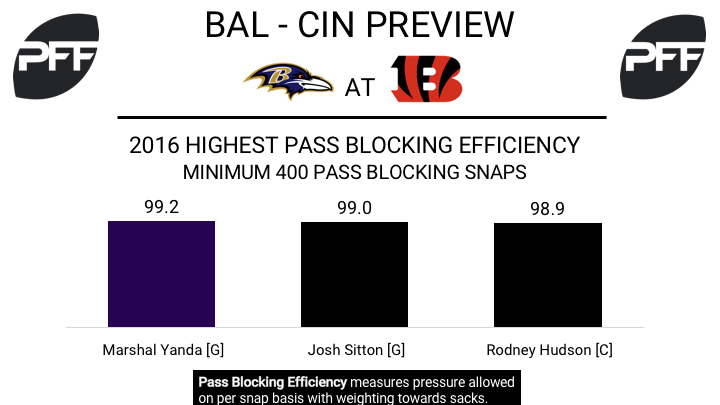 G Marshal Yanda vs DI Geno Atkins – Yanda was the sole offensive guard to earn an elite (greater than 90) grade in 2016, finishing with a grade of 91.6. Yanda was the most efficient pass-blocking offensive lineman last season, allowing just six total pressures (all hurries) on 572 pass-blocking snaps. He’ll have a tall task in preventing Atkins from getting to Dalton in Week 1, who has accumulated 390 pressures since 2010, the most by a defensive tackle. WR Mike Wallace vs CB Dre Kirkpatrick – The Ravens’ number one receiver earned a solid grade of 76.5 last season, while Kirkpatrick’s 72.4 grade was up 36.9 points from his 2015 grade (35.5). Kirkpatrick lined up almost exclusively on the left side last season, playing 907 snaps at left cornerback compared to just 21 snaps at other cornerback positions. Wallace, who lined up at right wide receiver on 36.1 percent of his snaps last season, should see a good amount of Kirkpatrick in this game. Kirkpatrick allowed a passer rating when targeted of just 68.9 last season, while quarterbacks had a 96.8 passer rating when targeting Wallace. RB Danny Woodhead vs LB Kevin Minter – Two newcomers will square off in this one, as both teams are looking for high returns on their free agent investments. Woodhead, coming off a year where he missed all but 55 snaps due to injury, will look to return to his 2015 form where he averaged 1.91 yards per route run (ninth among running backs) and earned a receiving grade of 88.8 (fourth highest among running backs). Minter, however, is far from an easy matchup for Woodhead. Minter allowed just 0.53 yards per coverage snap last season, the third best mark in the league among linebackers. RBs Jeremy Hill & Joe Mixon vs. LB C.J. Mosley – Mosley had a knack for finding the ball carrier last season. His 88.0 run defense grade was the third best among all linebackers last season, despite missing seven tackles against the run. Hill wasn’t able to create a lot for himself in 2016, finishing 30th in yards after contact per attempt and only generating 23 missed tackles on 222 carries. Mixon should provide a boost in that department, as he finished his last season at Oklahoma with 3.75 yards after contact per rush and 48 missed tackles on 187 carries. 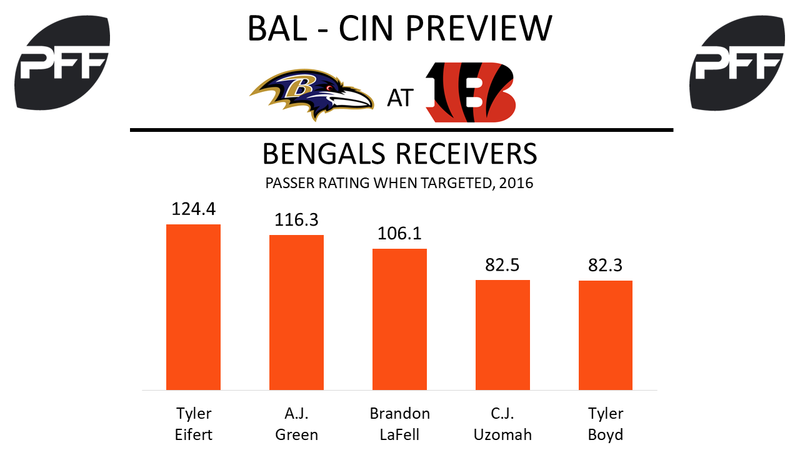 TE Tyler Eifert vs. S Tony Jefferson – The undersized free-agent addition to the Ravens secondary may be tasked with covering a big tight end in Eifert, who finished 2016 strong after returning from injury. When targeting Eifert, Andy Dalton had a passer rating of 124.4, the highest of any Bengals receiver last year. Jefferson is coming off of a career-best 2016 season where he earned an 88.4 overall grade and allowed only 0.35 yards per coverage snap, tied for 19th best among 92 safeties. Gs Clint Boling & Trey Hopkins vs DT Brandon Williams – Williams was a key part of the Ravens front seven that was stout against the run last season. He finished 11th among 75 defensive tackles with a 9.9 run stop percentage, earning an 80.4 overall grade. Boling had a career-worst 2016 season with a 73.0 overall grade, while Hopkins will be making his first career start. The right guard really struggled this preseason, earning just a 41.0 overall grade that was seventh lowest among all guards. WR Brandon LaFell vs. CB Brandon Carr – The Ravens secondary will give A.J. Green plenty of attention, so it’s once again up to LaFell to make some plays. Last season, he earned a 77.5 overall grade, and Dalton had a passer rating of 106.1 when targeting LaFell, the 25th highest among all wide receivers. When Carr was targeted in coverage in 2016, he allowed a passer rating of 101.9, good for 85th out of 117 cornerbacks.